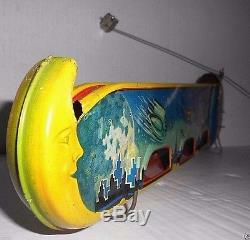 Up for viewing is this rare Vintage 1950's Technofix Terra Luna #262 TIN WIND UP SPACE TOY with two Orbiting Spaceships and Box. Technofix made two versions of this toy, one with orbiting spaceships and one without. This rare toy is all original and comes with two track spaceship cars. It works great and when wound the spaceship cars are placed on the track where they travel toward the moon and flip over and continue on the bottom track where they enter near the earth and reappear to repeat the action. Simultaneously the two spaceships rotate in an orbiting action with an 18 radius. The rods that hold the spaceships are very straight and without any bends. All tin construction with some of the best space themed lithography found on any toy produced in this era. Marked Patent applied for USA-Great Britain-Germany and Made in US Zone-Germany. Measures 19 1/4 long from the end of the moon to the end of the earth. Each spaceship measures 1 3/4 long. The tin lithograph is in excellent + condition with bright colors. The wind up mechanism is strong and long lasting with only a couple of turns of the wind up key. Comes with a vintage wind up key and box. Please see all photo's for they are considered. A major part of the description. The item "VINTAGE TECHNOFIX TERRA LUNA TIN WIND UP SPACE TOY with ORBITING SHIPS & BOX" is in sale since Monday, May 28, 2018. This item is in the category "Toys & Hobbies\Vintage & Antique Toys\Wind-up Toys". The seller is "cortel" and is located in East Hampton, New York. This item can be shipped worldwide.